It hit me this morning that I'm about to start planning my little girl's 8th birthday party. 8!! Where the heck did the time go?! I feel like she's growing up way too fast and there's no way to slow it down. She's in 2nd grade, learning math, English, how to tell time, and science and the precious few hours I get in the evenings with her I cherish. 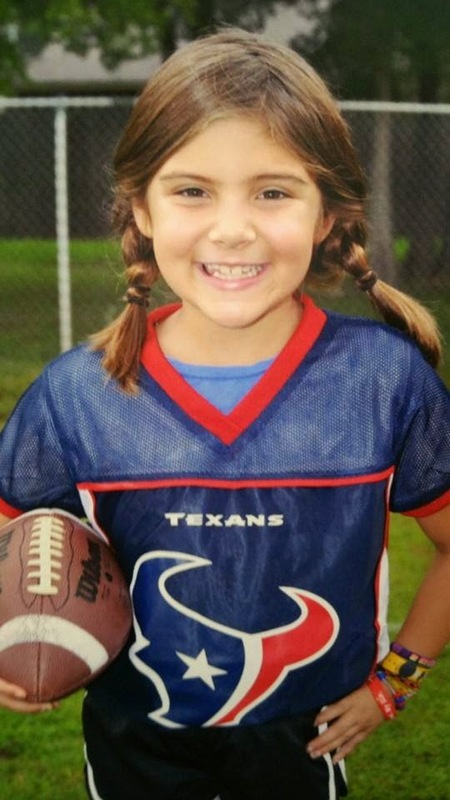 This beautiful little girl loves playing football, wall ball, riding her electric scooter, and making people laugh. She's my goofball (just like her Daddy!) and she owns my heart. We get asked on a daily basis if or when we're having more kids. Here's the honest truth... we always wanted 2 kids. Always planned for 2 kids. Until she came & became all we needed. We're so unbelievably happy just being her parents. I'm all for big families and people that have multiple kids, but for us, she was all we needed. Don't get me wrong, that girl knows how to push our buttons. She can talk back like I've never seen before, and she usually does when she's mad. She also climbs on my chair with me every night after bath to snuggle for a few minutes before bed. We read books together, do math problems, etc. and I love every second we get to have. Before long she'll be forgetting all about us and hanging out with her friends all day/night. But until then, she's our little girl and we are insanely proud of her.